The latest report on the state of the nation's banking industry was just released by the Federal Deposit Insurance Corporation. Things weren't pretty in Q1 2008. In fact, I'm inclined to describe the U.S. financial industry as "a mess" -- to use a technical term. "Commercial banks and savings institutions insured by the Federal Deposit Insurance Corporation (FDIC) reported net income of $19.3 billion in the first quarter of 2008, a decline of $16.3 billion (45.7 percent) from the $35.6 billion that the industry earned in the first quarter of 2007. In releasing the latest results, the FDIC cited higher provisions for loan losses as the primary reason for the drop in industry profits. The size of the earnings decline was mainly attributable to a few large institutions, but more than half of all insured institutions (50.4 percent) reported lower net income in the first quarter. "To sum up, while we may be past the worst of the turmoil in financial markets, we're still in the early stages of the traditional credit stress you typically see during an economic downturn," said FDIC Chairman Sheila C. Bair. "She went on to say that "given the weaker economy and rising level of problem loans, we're encouraging bank managers to stay on their toes. We're urging all institutions to make sure their reserves are large enough to cover expected losses. We also want them to beef up their capital cushions beyond regulatory minimums given uncertainties about the housing markets and the economy." * Loans that were noncurrent (90 days or more past due or in nonaccrual status) increased by $26 billion (or 24 percent) to $136 billion during the first quarter. That followed a $27 billion increase in the fourth quarter of 2007. Almost 90 percent of the increase in noncurrent loans in the first quarter consisted of real estate loans, but noncurrent levels increased in all major loan categories. At the end of the first quarter, 1.7 percent of the industry's loans and leases were noncurrent. * Earnings remain burdened by high provisions for loan losses. Rising levels of troubled loans, particularly in real estate portfolios, led many institutions to increase their provisions for loan losses in the quarter. Loss provisions totaled $37.1 billion, more than four times the $9.2 billion the industry set aside in the first quarter of 2007. Almost a quarter of the industry's net operating revenue (net interest income plus total noninterest income) went to building up loan-loss reserves. * The industry's "coverage" ratio -- its loss reserves as a percentage of nonperforming loans -- continued to erode. Loan-loss reserves increased by $18.5 billion (18.1 percent), the largest quarterly increase in more than 20 years, but the larger increase in noncurrent loans meant that the coverage ratio fell from 93 cents in reserves for every $1.00 of noncurrent loans to 89 cents, the lowest level since 1993. 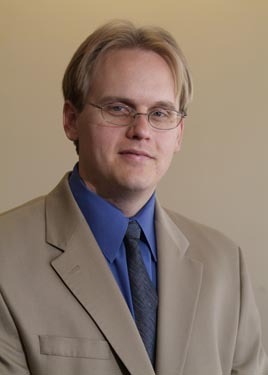 "This is a worrisome trend," Chairman Bair said. "It's the kind of thing that gives regulators heartburn." "The number of institutions on the FDIC’s “Problem List” increased from 76 to 90 in the first quarter. Total assets of “problem” institutions rose from $22.2 billion to $26.3 billion. This is the sixth consecutive quarter that the number of “problem” institutions has increased, from a historic low of 47 institutions at the end of third quarter 2006. The current level represents the largest number of institutions on the list since third quarter 2004, when there were 95 “problem” institutions." It's Thursday. Have you sold your bonds today? Well, someone certainly is -- the long bond futures are getting pummeled by another 23/32 today. We've broken the uptrend that dates back to last summer, and the 200-day moving average, as you can see in the chart above. Ten-year yields have broken out to the upside, and were recently at 4.08%. Waiting for Treasuries to break down in price (and break out in yield) has been a bit like waiting for Godot. But we're getting ever closer to the inevitable today, with 10-year yields rising to just over 4%. The key catalyst? A report showing April orders for durable goods (excluding volatile transportation orders) surged 2.5%, the biggest rise since last July and much stronger than expectations for a 0.5% decline. "Dow Chemical Co., the largest U.S. chemical maker, will raise prices on all of its products as much as 20 percent because of surging costs for energy, raw materials and transportation. "The increases are needed after a 42 percent jump in first- quarter spending on raw materials and energy, Chief Executive Officer Andrew Liveris said today in a statement. The increases take effect on June 1, Midland, Michigan-based Dow said. "Dow is trying to pass on higher costs to customers amid company forecasts that spending on energy and hydrocarbon-based ingredients will climb to $32 billion this year, four times the $8 billion the company spent in 2002. The rising costs are leading to ``difficult discussions'' with customers about increased prices for Dow products, Liveris said." UPDATE: I've added a chart of the iShares Lehman 20+ Year Treasury Bond Fund. This ETF holds long-term Treasuries and is a good proxy for bond prices. You can see how the 200-day moving average has given way, and how bond prices are breaking down from a multi-week trading range. * Sales rose 3.3% to a seasonally adjusted annual rate of 526,000 in April from 509,000 in March. However, March's figure was downwardly revised from a previous estimate of 526,000. The government also shaved its estimates of the previous few months' worth of home sales (by 3,000 in February, for instance, and 10,000 in January). From a year earlier, sales plunged 42%. * I have consistently noted that the one bright spot in the new home side of the market is the steady decline in the number of homes for sale. That trend continued into April, with the number of homes on the market slipping 2.4% to 456,000 from 467,000 in March. Supply is also down 17% from a year earlier. The "months supply at current sales pace" indicator of inventory improved slightly as well -- to 10.6 from 11.1 a month earlier. * The median price of a new home rose 9.1% to $246,100 from $225,500 in March. Prices were also up 1.5% from a year earlier, the best showing since November (+3.7%). Bottom line -- The April numbers look better in comparison to some of the housing market readings we've seen recently. But considering that March showed the biggest year-over-year price decline for new homes since 1970 ... and that March was the worst sales month since 1991 ... a little bounce back was to be expected. * Prices fell 2.2% from February in 20 major U.S. metropolitan areas. Prices were off 14.4% from a year earlier. That was worse than the 12.7% drop in February and the 10.6% decline reported in January. This is the biggest decline so far for the monthly index, which was first published in 2001. * The 10-city index has a longer history. It declined 15.3% year-over-year in March. That was worse than the 13.5% drop in February and the worst since S&P started tracking in the late 1980s. * Prices fell from year-ago levels in all but one of the 20 cities that the group tracks. The biggest declines were found in Las Vegas (-25.9%), Miami (-24.6%), Phoenix (-23%), and California (-20.2% in San Francisco, -20.5% in San Diego, -21.7% in Los Angeles). The only metropolitan area showing a gain was Charlotte at +0.8%. * Sales dropped 1% to a seasonally adjusted annual rate of 4.89 million in April from 4.94 million in March (previously reported as 4.93 million). That was a bit better than the forecast of 4.85 million home sales. Sales were down 17.5% from the year earlier reading of 5.93 million, and they matched the cycle (and record) low of 4.89 million units in January. * By region, sales dropped 4.4% in the Northeast and 6% in the Midwest. Sales were unchanged in the South and up 6.4% in the West. By property type, sales dropped 0.5% in the single-family market and 5.2% in the condo arena. * The supply of homes for sale shot up 10.5% to 4.552 million units in April from 4.118 million in March (previously reported as 4.058 million) and 4.22 million a year earlier. The absolute number of homes for sale is just shy of the 4.561 million peak, set last July. Single-family home only inventory rose to 3.9 million homes, the highest I can find on record (my data goes back to 1982 -- chart above). On a months supply at current sales pace basis, inventory jumped to 11.2 months from 10 months in March (previously reported as 9.9) and 8.5 a year earlier. That is a new record, though the data for SFH+condos+coops only goes back to 1999. The SFH-only data (10.7 months) shows this is the most oversupplied the market has been since 1985. * Median home prices rose 1.1% to $202,300 in April from $200,100 in March (previously reported as $200,000). They fell 8% from $219,900 a year earlier, however, the eighth month in a row of year-over-year declines. The headline writers are probably having a tough time coming up with new ways to say "The housing market stinks." But that's clearly what the latest numbers show. Home sales dipped again in April. Home prices took the eighth year-over-year tumble in a row. Most importantly, the inventory of homes for sale surged. We're now the most oversupplied since the mid-1980s. The only way we're going to clear this supply glut is through lower prices. Some markets -- specifically, those with the most aggressive price cutting going on -- appear to be making some progress on the inventory front. Traditional sellers, lenders loaded down with REO property, and home builders in those markets are doing what they need to do to attract buyers. Others aren't making as much progress because sellers there are just too stubborn. Bottom line: The 2008 spring selling season will go down in the books as another disappointing one, just as I expected. "Credit-default swaps on the Markit iTraxx Europe index of 125 companies with investment-grade ratings rose 4.25 basis points to 84.5 as of 11:48 a.m. in London trading, according to JPMorgan Chase & Co. Contracts on the Markit iTraxx Crossover Index of 50 companies with mostly high-risk, high-yield credit ratings increased 15 basis points to 461, JPMorgan prices show. "Defaults by Tropicana LLC, the Atlantic City casino operator, and U.S. housewares retailer Linens 'n Things Inc. helped push this year's total to 28, compared with 22 borrowers that missed payments in all of 2007, Standard & Poor's said in a report yesterday. The global default rate will rise to 4.7 percent in the next 12 months from a 25-year low of 0.97 percent at the end of 2007, according to S&P. The average since 1981 is about 4.35 percent." "Highlighting their desperation to sell houses, builders are bringing back the gimmicks -- mortgage rates that start low, help with down payments, zero out-of-pocket expenses -- that helped fuel the housing bubble before it went bust. "But this time, they say, history won't repeat itself. "This weekend, Lennar Corp., the nation's largest builder by revenue, will start interest rates at 2.88% for the first year -- 3.88% for the second -- before a slightly higher rate locks "for life." In some markets, Ryland Group Inc. will cover the down payment and closing costs, while KB Home has zero-down deals. Hovnanian Enterprises Inc., meanwhile, also is helping buyers secure down payments, and its mortgage subsidiary eliminated loan closing fees. "Builders, trying to survive the worst downturn since the Depression, must move inventory quickly to bring in cash: Stung by eroding land and house values that show no sign of stabilizing, the nation's top builders have racked up more than $24 billion in impairment charges, according to Standard & Poor's. "Builders acknowledge things are tough, but they promise they are being responsible: To keep people out of houses they can't afford, they are scrutinizing income and credit scores and making sure loans don't reset with unbearable payments." I would argue that the incentives never really went away. I've seen builders continue to offer all kinds of sweeteners to drive traffic. It's worth noting that the fine print (and sometimes, the big print) in advertisements has shifted. Many offers are dependent on the ability of the borrower to obtain FHA financing, rather than private mortgages. Some deals assume the involvement of down payment assistance programs, which are somewhat controversial in their own right. "$0 down offer assumes buyer will qualify to obtain down payment from a non-profit down payment assistance program. Funds to cover closing costs paid by seller as defined on your good faith estimate, are subject to seller contribution limits and do not include prepaids. Offers, incentives and seller contributions are subject to certain terms, conditions and restrictions and are available only to qualified buyers financing through Universal American Mortgage Company and closing with designated closing agents. Lennar reserves the right to change or withdraw any offer at any time. $0 down/$0 closing costs offer is only good on inventory homes that sell and close by 5/30/08 and can only be used with FHA loans." There's some interesting bond market action worth noting today: The yield on the benchmark 10-year Treasury Note is pushing the top end of its recent range, recently at 3.92%. We've also seen the 10-year TIPS spread widen out. It's the difference between yields on nominal 10-year Treasury Notes and yields on 10-year Treasury Inflation Protected Securities, and it's a key market-based indicator of inflation concern. The spread was recently just above 256 basis points, the highest going all the way back to August 2006. I continue to believe that a sharp break in bond prices (and a sharp rise in interest rates) is a key risk going forward. UPDATE: Treasuries continue to sell off late in the day, with 10-year yields pushing 3.94% at last count. Meanwhile, I had a chance to check out Bill Gross' latest commentary, which is focused on the striking difference between our CPI figures and the inflation figures being reported around the world. It's nothing new to see bureaucrats get savaged about the accuracy of CPI data -- data that doesn't really reflect what we as Americans see in our daily lives. But it's notable to see this kind of critique coming from a guy who oversees the world's largest bond investment firm. Demand destruction is the fancy economic term for what happens when the price of a commodity (in today's case, oil) gets too high. Once the price goes up so much, users can no longer afford the cost. They find ways to conserve and cut back on oil usage. This destroys demand for the commodity, and prices collapse. I got to thinking about this topic after reading the following New York Times story on American Airlines. Is this a sign that high prices are starting to destroy demand (by driving fares out of reach of U.S. consumers, by forcing airlines to cut capacity -- thereby reducing demand for jet fuel, and so on)? "American Airlines, the nation’s largest air carrier, said Wednesday that it would begin charging $15 for many passengers to check their first bag, eliminating a free service that passengers in the United States have come to expect during the modern jet era. "American made its announcement during the annual meeting held by its parent company, the AMR Corporation, in Fort Worth. "At the same time, American said it would take up to 85 aircraft out of its fleet, including jets and commuter planes, by the end of the year, one of the biggest cutbacks since the airlines culled their fleets after the September 2001 attacks. American has about 960 aircraft at the mainline airline and its American Eagle subsidiary. "The reductions will translate to an 11 to 12 percent cut in service during the fourth quarter, American officials said. They said the airline would eliminate some jobs, but did not give specifics." "Crude oil rose to a record above $132 a barrel as U.S. stockpiles unexpectedly dropped and banks raised price forecasts because of supply constraints and demand growth. "Supplies fell 5.32 million barrels to 320.4 million last week, the biggest drop in four months, the Energy Department said. Oil for December 2016 delivery rose more than $19 a barrel, or 16 percent, after Goldman Sachs Group Inc. on May 16 raised its outlook to $141 a barrel for the second-half of the year. "Crude oil for July delivery rose $2.53, or 2 percent, to $131.51 a barrel at 12:27 p.m. on the New York Mercantile Exchange, after reaching $132.08. Prices have almost doubled from a year ago." My personal take, for what it's worth, is that a fundamentally strong market is now morphing into just the latest in a series of speculative bubbles. Lots of forces have been driving oil prices higher for the past few years. But we are now making the boom-to-bubble transition thanks, in part, to our friends at the Federal Reserve. They threw easy money at the dot-com bust, creating the monetary conditions necessary for a housing bubble. In the past several months, they have been throwing easy money and rate cuts at the housing bust. That has now poured monetary gasoline onto an already red-hot fire in oil and other commodities. In other words, the Fed is accomodating the rise in commodities prices -- just like it did in the 1970s -- and the result is the miserable version of Stagflation-lite we have today. "Some observers have questioned whether the news on fundamentals affecting supply and demand in commodities markets has been sufficient to justify the sharp price increases in recent months. Some of these commentators have cited the actions of the Federal Reserve in reducing interest rates as an important consideration boosting commodity prices. To be sure, commodity prices did rise as interest rates fell. However, for many commodities, inventories have fallen to all-time lows, a development that casts doubt on the premise that speculative demand boosted by low interest rates has pushed prices above levels that would be consistent with the fundamentals of supply and demand. As interest rates in the United States fell relative to those abroad, the dollar declined, which could have boosted the prices of commodities commonly priced in dollars by reducing their cost in terms of other currencies, hence raising the amount demanded by people using those currencies. But the prices of commodities have risen substantially in terms of all currencies, not just the dollar. In sum, lower interest rates and the reduced foreign exchange value of the dollar may have played a role in the rise in the prices of oil and other commodities, but it probably has been a small one." But I don't agree. You simply can't run a persistently negative interest rate policy without consequences. You simply can't keep bailing out the last round of speculators without emboldening the next round. Yet here we sit, with a 2% nominal funds rate and a 3.9% year-over-year rate of CPI inflation, and the Fed doggedly pursuing its "Trash for Treasuries" policy. Anyway, some more thoughts on the oil bubble/no bubble argument can be found at the Econbrowser blog and RGE Monitor, if you're interested. * Mortgage activity slumped in the most recent week, according to the Mortgage Bankers Association. Purchase applications were down 6.9%, while refis were down 8.7%. At 352.5, the purchase index is just off its 2008 low (240.1 in the week of 4/25). * Troubled lender Impac Mortgage Holdings lost a few bucks in 2007 -- specifically, $2.05 billion. The firm's provision for loan losses rose more than 40-fold to $1.39 billion from $34.6 million in 2006. That's going to leave a mark. * The debate over an FHA-backed housing rescue plan continues. We'll have to see how the full Senate tackles the issue, and how the Senate bill is reconciled with the plan the House has already signed off on. "With the information now in hand, it is my judgment that monetary policy appears to be appropriately calibrated for now to promote both rising employment and moderating inflation over the medium term. But a large measure of uncertainty surrounds that judgment and as the economy evolves, so will the appropriate stance of policy." There's a lot of other stuff in the speech about commodity prices, the Fed's role in helping drive them higher and so on. You know I've been harping on that issue for a while now. "Like a lot of small-scale entrepreneurs, Cathy Osborne worries that she'll go out of business if fuel prices rise above $4 a gallon. Not because she won't be able to buy gas at that price, but because she won't be able to sell it. "The old mechanical gas pumps with scrolling dials at her country store in Fauquier County lack the gears to go beyond $3.99 a gallon. State inspectors shut down her diesel pump several months ago when the fuel topped the $4 mark, so now all that's left are two pumps dispensing 87-octane gasoline, set at $3.75 -- and climbing. "I don't know what I'm going to do. I don't have $30,000 to invest in new pumps, and I'm barely skipping by," said Osborne, who owns the Orlean Market and Restaurant, a store dating from 1892 with horse-country views of the Blue Ridge Mountains and miles of rolling Virginia Piedmont. "Osborne said she doesn't make money on fuel sales, but the pumps are a big draw for the hay farmers and cattlemen who gas up their tractors and take their morning coffee in her store. The next-closest service station is a 40-minute round-trip drive to Warrenton, and in Orlean, Osborne's barbecue sandwiches and Amish-baked cherry pie face no competition." Meanwhile, regarding my last post about inflation expectations, the Fed has said repeatedly that it closely monitors them. Official after official has come out and said that rising inflation expectations would be a real problem. One example: Chicago Fed President Charles Evans said earlier this week that "any increase in inflation expectations would pose an important risk to the achievement of price stability." Well, 1-year forward inflation expectations are now at the highest level since February 1982. Five-year forward expectations are the worst since August 1996. The federal funds rate was 15% and 5.25%, respectively, at those times. So I'm sure any minute now, we'll hear an announcement about an emergency Fed conference call and subsequent rate hike. Yeah, right. More than likely, the Fed will continue to maintain its "all hat, no cattle" approach to fighting inflation. Yesterday I posted about the Fed's current dilemma: The growth numbers don't look good, but the inflation numbers are off the charts. That trend continued into May, according to the latest figures from the University of Michigan. The group's confidence index dropped to 59.5 from 62.6 in April. That's the lowest reading since June 1980. Indices that track both current conditions and the outlook for the future slumped. Here's the kicker: An index that measures inflation expectations for the next year jumped. Consumers now expect inflation to run at a 5.2% page over the coming 12 months. That's up from 4.8% in April and the highest reading going all the way back to February 1982 (a tie). Five-year forward inflation expectations climbed to 3.3% from 3.2%. That's the highest reading since August 1996 (a tie). * Overall housing starts came in at a seasonally adjusted annual rate of 1.032 million last month, up 8.2% from an upwardly revised 954,000 in March (previously reported as 947,000). Starts were down 30.5% from 1.485 million in April 2007, but well above forecasts for a reading of 939,000. * Building permit issuance also popped -- 4.9% to 978,000 units from an upwardly revised 932,000 in March (previously reported as 927,000). That's still down 32.9% from the year-earlier reading of 1.457 million, but above the average forecast of 978,000. * Breaking it down by property type, single-family starts were down 1.7% to 692,000 from 704,000. But multifamily starts rose 36% to 340,000 from 250,000. Single-family permitting activity increased 4% to 646,000 from 621,000, while multifamily permitting climbed 6.8% to 332,000 from 311,000. * Regionally, starts fell 12.8% in the Northeast. But they rose 24.4% in the Midwest, increased 3.6% in the South and rose 18.5% in the West. Permits dipped 1.8% in both the Northeast and the South. But they climbed 11.9% in the West and 27% in the Midwest. Meanwhile, single family starts are much less volatile and in that part of the market, the discouraging trend remains. One-family starts have now declined for 12 straight months in a row, leaving them at their lowest level since January 1991. The permitting data was a bit more encouraging, with both single-family and multi-family permit issuance rising last month. The key question is whether the pop in activity is sustainable. We also can't lose sight of the demand side of the "supply and demand" equation. The news isn't all that encouraging there. While deeply discounted homes and REO super-bargains are moving, existing home sellers and home builders are still having a tough time clearing out inventory. That's the story told by the NAHB figures yesterday, which showed current sales activity slumping to a fresh low and buyer traffic waning. * The overall index slipped to 19 this month from 20 in April. Economists were expecting an unchanged reading. The cycle low (so far) was 18 in December. * The sub-index measuring current home sales fell 1 point to 17, a fresh cycle low. The sub-index measuring expectations about future sales dropped 3 points to 27. And the sub-index measuring prospective buyer traffic slumped 2 points to 17. * Regionally, we saw declines in three of four tracked areas. The index fell 4 points to 18 in the Northeast, 3 points to 12 in the Midwest, and 2 points to 22 in the South. The index climbed 3 points to 20 in the West. If you're looking for positive housing news, you're not going to find it in today's report. NAHB figures show the housing market continues to struggle, with builder confidence broadly slumping and buyer traffic cooling. The causes are well-documented: Tighter lending standards, rising unemployment, and a lack of confidence among potential home buyers. That said, lower home prices are starting to work their magic in select locales. They are enticing some bargain hunters off the sidelines, and helping us chip away at the mountain of inventory for sale. It will take quite some time for supply and demand to come back in line. But at least it's a start. For starters, today's figures were disappointing on the growth front. The May Empire Manufacturing index came in at -3.2. That compares to an April reading of 0.6 and expectations for a reading of 0. Meanwhile, industry production was down 0.7% in April. That compared with a March reading of +0.2% and expectations for a -0.3% figure. Capacity utilization also dipped to 79.7% from 80.4%. That's the lowest reading since September 2005 and below expectations for a reading of 80.1%. Lastly, initial jobless claims rose to 371,000 in the most recent week from 365,000 in the week before. Continuing claims climbed to 3.06 million, the highest since March 2004. At the same time, respondents to the Empire State survey said inflationary pressures are rising. Their input costs rose 8.7% in the past year, on average, while their selling prices rose by roughly 3%. In other words, rising costs aren't being completely passed through. But companies are clearly finding ways to charge more, raising inflation risk. And in early trading, crude oil is up by another $1.80 to just over $126 a barrel. UPDATE: The Philadelphia Fed index came in at -15.6 in May vs. -24.9 in April and expectations for a reading of -19. Combing through the details, the new orders index improved to -3.7 from -18.8 and the employment index climbed to -1 from -11.1. Meanwhile, the prices paid index rose to 53.8 from 51.6 and the prices received index climbed to 31.6 from 30.9. The saga continues: Growth weak, inflation pressures elevated. I've seen a lot of weird numbers in my lifetime, but this latest Consumer Price Index takes the cake. The overall CPI reportedly increased 0.2% in April, down from 0.3% in March. Meanwhile, the "core" (ex-food and energy) CPI gained only 0.1%. That brings the year-over-year rate in CPI inflation down to 3.9% from 4%, and leaves the core CPI YOY gain at 2.3%, down from 2.4%. But here's where things get curioser and curioser. The CPI figures included a 0.7% drop in the cost of transportation, driven by -- you'll love this -- a "2.0 percent decrease in the index for gasoline." Is there anybody in their right mind who believes gasoline prices are going DOWN? And it gets better. Quoting from the release: "The index for public transportation declined 0.4 percent in April, reflecting a 0.5 percent decrease in the index for airline fares." Is it just me, or haven't we been reading about multiple fare hikes in the past few weeks? I can understand some of the other decreases, such as the drops in recreation prices, and automobile and lodging costs. They are likely coming down due to the weak economy. But this energy and airfare stuff is just plain hokey. Regardless of what I think, the bond market likes the news for now -- 10-year yields were up to 3.97% before the report. They're down to roughly 3.92% as of this writing. "More U.S. homeowners fell behind on mortgage payments last month, driving the number of homes facing foreclosure up 65 percent versus the same month last year and contributing to a deepening slide in home values, a research company said Tuesday. 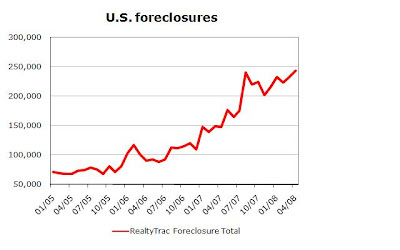 "Nationwide, 243,353 homes received at least one foreclosure-related filing in April, up 65 percent from 147,708 in the same month last year and up 4 percent since March, RealtyTrac Inc. said. "Nevada, Arizona, California and Florida were among the hardest hit states, with metropolitan areas in California and Florida accounting for nine of the top 10 areas with the highest rate of foreclosure, the company said. Incidentally, this is a new high for total filings, as you can see in the chart above. The previous monthly record was 239,851 in August 2007. "Bank of America Corp., the nation's biggest consumer bank, said losses on home-equity loans will be even worse than predicted three weeks earlier, adding to evidence that more consumers are falling behind on debts. "More customers are under financial stress and using credit cards to pay for necessities, said Liam McGee, president of the consumer and small business division, at an investor conference today in New York. Losses on the bank's $118 billion in loans linked to home values may top 2.5 percent, higher than the 2 percent to 2.5 percent projected last month. "Credit-card customers are cutting back on retail, travel and entertainment purchases, said McGee, whose company is the nation's largest credit-card issuer and ranks No. 1 by deposits. That backs up economists and bankers who say the U.S. may be teetering near a recession as consumers struggle with job losses and gasoline prices of more than $4 a gallon. "McGee said Bank of America expects the economy, measured by real gross domestic product, will shrink in the second quarter. The bank had $184 billion of credit card debt outstanding at the end of the first quarter and about a 20 percent market share. "Credit and debit-card purchases for "necessary'' items, including fuel, food and utilities, grew by 13 percent in the first quarter, while spending for retail, travel and entertainment increased 0.5 percent, the bank said today." "Losses to date on loans backing 2005-2007 vintage subprime second lien-backed RMBS have greatly exceeded Moody's original expectations. Beginning early in their lives, second lien pools included in 2006 and 2007 transactions saw substantially higher delinquency and loss levels in comparison to earlier vintages at the same level of seasoning. Three months after issuance, serious delinquencies (those more than 60 days) on 2006 vintage loans were 2.7% of original issuance compared with 1.7% for 2005 vintage pools. 2007 vintage loans deteriorated even more rapidly; by month three, 5.3% of loans were seriously delinquent, nearly double the level for 2006. The extreme level of early payment default seems to be attributable to aggressive loan underwriting as well as to payment behavior by certain homeowners who may never have intended to make a payment on their loans. "Pool losses came quickly with the rapidly rising delinquencies. Unlike first lien loans that go through a lengthy process of foreclosure, second lien loans are written off by servicers when they expect that no recovery is foreseeable. In light of the pressure on home prices and limited or negative borrower equity in their homes, many second lien loans were simply written off after being delinquent for six months. Because the limited borrower equity left little room for recovery, many of the loans have defaulted with severities around 100%." "With only 15 months of seasoning, 2006 vintage loans have lost nearly 10% of their original balance, and 2007 vintage pools have lost just over 8% by month 9. Even with these early losses, the pace of delinquency has not yet significantly slowed with seasoning. Troubled borrowers concerned about losing their houses tend to default on their second lien loans before their first lien loans because, with no equity in the home, the second lien lender has little incentive to pursue foreclosure." That's a lot of jargon and industry-speak to digest -- and it might leave you wondering what things look like on the ground. What's happening with second lien loans in the "real world" and why are they performing so poorly? Well, I just stumbled across a nearby town house listing. It's advertised as a short sale at $108,000 (subject to bank approval, of course). So I did a bit more digging into the property's history. Turns out it sold for just under $80,000 in August of 1990, then next changed hands for a little less than $90,000 in May 2001. Total gain in almost 11 years: about 13%. It next sold for $94,000 in November of 2002. But shortly thereafter, our bubble here in South Florida started inflating. Before long, people were outbidding each other left and right for both new and existing homes and lending restrictions were being slashed to the bone. The same property then changed hands for $170,500 in October 2004 -- up more than 81% in just under two years. Here's the kicker -- it looks like the property was financed with a $153,450 first mortgage and a home equity line of credit for $17,050. Yes, that means the buyers put nothing down on a home that had almost doubled in value in just a couple of years. And yes, this same town house -- with $170,500 in loans (minus whatever principal has been paid down in the meantime) -- is now being marketed as a short sale for almost $63,000 less. I'm betting the second lien lender isn't feeling too warm and fuzzy about his loan. Hopefully this example gives you an idea why second lien lenders are in a world of hurt, especially if they're loaded up with loans against properties in markets where values are deflating fast. "Here's another consequence of the troubled housing market: Some homeowners associations are running low on cash. "The association at Monaco Place, a community of single-family homes and condominiums in Denver, is short $250,000 of its $9.3 million annual operating budget. It can't pay for needed roof and siding repairs to homes. Potholes in the streets haven't been filled in order to save money to keep electricity running in common areas, says Dee Tyler, CEO of Colorado Association Services, which manages the association. Monaco Place was already suffering from a high rate of foreclosures before the credit crunch hit. In the past three years, about a third of its 193 units have been foreclosed on. "Like Monaco Place, a growing number of homeowner and condominium associations across the country are raising their fees or putting the brakes on clubhouse improvements, new landscaping and other shared neighborhood amenities. The kitty is so low for some that essential services, such as building maintenance, electricity, trash removal and repairs have been cut. "As community residents lose their homes to foreclosure and new home building has slowed considerably, many of the roughly 300,000 neighborhood associations in the U.S. are grappling with shrunken budgets. One estimate puts the delinquency rate on dues at less than 5% in many markets -- higher than normal, though still not enough to threaten basic services, says John Carona, president of Associa, a Dallas-based company that represents 7,000 community associations in 26 states. Normally, the delinquency rate is about 2%, he says. "Elsewhere, the rate is much higher. At Spanos Park East in Stockton, Calif., owners of about 25% of the development's 1,500 single-family homes have been delinquent in paying their quarterly dues, according to Adrianne Bretao, a manager at M&C Associations Management Services, which helps to manage the community association. As a result, the association has put off expanding a patio area in the clubhouse and swimming pool this year, says Denise Laven, the association's president." Personally, my family lives in a South Florida community with a neighborhood association. We haven't been hit with a sharp rise in dues. But plenty of homes are owned by recent purchasers and out-of-area speculators, and foreclosures are starting to crop up (the house across the street is in pre-foreclosure, with a nice browning lawn to boot!). So it could happen down the road. * The West led the declines with a -12.3% change, followed by the Midwest at -7.9% and the South at -7.5%. Only the Northeast notched a gain of +3.2%. * The biggest year-over-year price gains, by metropolitan area: Binghamton, NY at +11.8%, Peoria, IL at +10.4%, and Spartanburg, SC at +10.1%. Other scattered gainers were located in New York, Texas, and Illinois. * The worst performers were cities like Sacramento-Roseville, CA (-29.2%), Riverside-San Bernardino, CA (-27.7%) and Lansing-E.Lansing, MI (-26.9%). Other "biggest loser" markets were concentrated in California, Florida, Ohio, and parts of the Southwest. * All told, prices fell from year-ago levels in 100 of the 149 (67.1%) metropolitan areas surveyed. That compares to 77 of 150 (51.3%) metro areas in Q4 2007. Prices are now falling in more metro areas than at any other time since the NAR began collecting this information in 1979. As the housing slump enters its third year, home price declines are both deepening and broadening. Price declines have accelerated in markets that were overrun by speculators during the boom, including many parts of California and Florida. Meanwhile, the "losers list" of declining markets has expanded -- so much so that a record number of metropolitan areas are showing year-over-year price drops. I believe the economic slowdown, which is causing unemployment to rise in a broader array of communities, is to blame. Another contributing factor is the credit crunch, which is curtailing financing options for borrowers all around the country. The silver lining to this dark cloud? The faster and farther prices fall, the sooner bargain hunters will be lured off the sidelines -- and the less time it will take to get housing supply back in line with demand. * Import prices jumped 1.8% on the month, bigger than the 1.6% increase that economists were expecting. More importantly, the year-over-year rate of import inflation is up to a whopping 15.4% (vs. 14.9% in March). As you can see in the chart above, this is the fastest rate of import inflation in the history of the data series, which goes back to 1982. * What about the details? Ex-petroleum import prices were up 1.1% on the month, and up 6.2% YOY. That's the fastest rise since 1988. Even if you strip out all fuels, you get a 1% monthly rise and a 5.8% YOY increase. * Food and beverage prices were up 0.4% on the month (12.6% YOY), industrial supply prices rose 3.9% (37.3% YOY! ), capital goods prices were up 0.8% (2.1% YOY), and consumer goods prices gained 0.2% (2.8% YOY). As you know, I have also been watching the price of imports from China. They increased once again -- though the monthly gain moderated to 0.2% from 0.6% in March. Chinese imports are up 4.1% in price from a year ago. Another key piece of data: The retail sales report from April was in line with expectations -- down 0.2%. But if you strip out autos, you get a 0.5% rise, better than the 0.2% increase economists were expecting. Look, I'm sorry if this sounds hyperbolic, but these inflation rates are out of control. Out of control. We are talking about a year-over-year import inflation rate of more than 15% -- the most ever (figures go back to 1982). In his satellite-delivered remarks to the Federal Reserve Bank of Atlanta Financial Markets Conference in Sea Island, Georgia today, Fed Chairman Ben Bernanke focused exclusively on conditions in financial markets, and the Fed's efforts to boost liquidity. But somebody at the Fed better step up and start sounding the inflation alarm. Bond traders aren't waiting around, by the way. They're selling -- long bond futures were recently down 19/32 in price. The yield on the 2-year Treasury Note has surged 12 basis points to 2.42%. * HSBC set aside $3.2 billion to cover bad U.S. loans. That sounds awful, but it's actually below the $4.2 billion to $4.8 billion that analysts polled by Bloomberg were expecting. HSBC got into subprime mortgage lending in a big way when it acquired Household International back in 2003. * Bond insurance firm MBIA announced a Q1 net loss of $2.4 billion, which compares to a profit of $198.6 million in the year-earlier period. The biggest hit came from a $3.6 billion, unrealized pre-tax loss on credit derivatives. "It was the third closure this year of an FDIC-insured bank. Douglass National Bank, a Missouri bank with $58.5 million in assets, was shut in January; another Missouri institution with assets of $18.7 million, Hume Bank, was shut down in March. "Both were dwarfed in size of ANB Financial, where regulators found lax lending standards, mostly for construction and development loans for projects in Utah, Idaho and Wyoming, as well as Arkansas." "In the first three months of this year, banks have launched preliminary foreclosure actions - known as lis pendens proceedings - against a record 120 borrowers in East Hampton and Southampton towns. "Twenty percent of those borrowers live in homes that are worth more than $1 million, according to figures from the Suffolk County clerk. "And the list gets longer every week. "This problem didn't even exist before," said John Brady, a broker with Coldwell Banker in East Hampton. "They used to pop up once in a while, and you wouldn't even pay attention. Now you expect to see new ones every week." "A total of 10 East End homes, including a massive Westhampton mansion, were foreclosed outright since the beginning of the year. "In addition, more than 800 East End homeowners - a mix of rich and middle-class people from Riverhead to Montauk - have been flagged by credit-monitoring companies this year for late payments." American International Group is latest financial firm to go begging for billions from investors. The global insurance firm reported a gigantic $7.81 billion net loss in the first quarter, the most in the company's history, due to writedowns on complex derivatives contracts (think credit default swaps) and losses on other investment holdings (residential mortgage backed securities, structured securities and so on). So it's raising $12.5 billion in stock, debt, and other equity-linked securities. Standard & Poor's cut its rating on AIG to AA- from AA in the wake of the news. Good thing that Alan Greenspan and Treasury Secretary Henry Paulson just told us the worst of the credit crisis is over. Otherwise, I might be worried. "Inflation is reemerging as a threat to economic stability after years of "quiescence,"' and officials must be wary of policies that stoke consumer prices, the International Monetary Fund's deputy chief said. "This inflation speed-up must be taken seriously as it creates potentially significant challenges to economic stability," John Lipsky, the IMF's first deputy managing director, said in a speech in New York today. A return to 1970s- style high inflation and rising price expectations "cannot be discarded out of hand,'' he said. "While the surge in energy and other commodity prices is the main cause of the danger, low central bank interest rates and a falling dollar are also contributing, Lipsky said. Speaking after the European Central Bank kept its main rate at a six-year high, the official said the inflation outlook "appropriately is central'' to European policy makers' priorities. "In the U.S., as growth "recovers,'' consumer-price developments will "assume greater importance'' for the Federal Reserve, said Lipsky, a former JPMorgan Chase & Co. chief economist who joined the IMF in 2006. "Low interest rates have a statistically significant impact on commodity prices'' according to preliminary evidence, the IMF official said. "Exchange-rate shifts also appear to influence commodity prices." * Meanwhile, ECB president Jean-Claude Trichet continues to talk about the inflation threat, noting that "Our fellow citizens are not happy with the present level of inflation" and that "there's no time for complacency in any respect" as far as inflation expectations are concerned. As I've been noting for some time, the Fed's aggressive rate cuts and extraordinary efforts to grease the credit market wheels have caused problems elsewhere in the economy. They have driven real interest rates well into negative territory, and that is helping contribute to the run up in commodity prices, as well as generalized inflation. Late yesterday, we got some startling statistics. In the month of March, consumer credit outstanding (auto loans, credit cards, and other non-real estate loans) surged $15.3 billion. That was the biggest rise since November and much more than the $6 billion economists were expecting. In fact, consumers took out $34 billion in consumer loans during the first quarter, the most since 2001. It’s generally considered healthy when consumer borrowing rises. It shows that consumers are ready and willing to borrow and spend, promoting growth. But that’s only if the economy is strong and consumer balance sheets are in good shape. And you probably don’t need me to tell you that is most definitely NOT the case right now. * First, falling home values and tighter mortgage lending standards have all but shut down the “housing ATM.” Borrowers had grown accustomed to taking out home equity loans and lines of credit, then using that money to pay for vacations, boats, RVs, and more. They can’t do that any more – either because their equity has evaporated or because banks no longer want to lend against what remains out of fear home prices will fall further – leaving them holding the bag. * Second, surging food and energy prices have left consumers with few options. Their incomes generally aren’t keeping pace with inflation, so they’re being forced to use credit cards to finance even everyday purchases. In other words, this surge in consumer credit isn’t a sign of strength. It’s a sign of weakness. It also leads me to believe that delinquency rates on consumer loans will continue their upward trend. It's pending home sales day again. This time, the National Association of Realtors is providing data on pending sales activity for March. What did the numbers show? * Pendings dropped 1% in March, right in line with the forecast for a 1% decline. February's reading was revised lower, however -- to -2.8% from the previously reported 1.9% decline. * Regionally, pending sales fell in 3 out of 4 regions -- the Midwest (-10.4%), the South (-0.1%), and the West (-1.4%). Sales rose 12.5% in the Northeast. * The index level was 83 in March, down 20.1% from the year-earlier reading of 103.9. That's the worst on record for this index, which dates back to January 2001. The string of unimpressive housing numbers continues, with pending home sales showing another decline in the month of March. Sales are down more than 20% from a year ago, and almost 35% from their April 2005 peak. There's a real risk that many of these pending sales won't turn into closed transactions, too, given the tightening we've seen in the mortgage lending market. The latest Federal Reserve figures show that a greater percentage of lenders than ever before are tightening standards on prime mortgages. And you don't need me to tell you the subprime market is all but gone. If there's a bright spot out there, it's that the supply of homes for sale does appear to be declining in some markets. I attribute that to a combination of falling construction activity, fire sales of spec homes by home builders, and aggressive pricing by other motivated sellers, including banks holding foreclosed properties. The quicker prices decline, the sooner affordability will be restored, and the faster the overhang of inventory will be worked down. * UBS lost a whopping $10.9 billion in the first quarter. It also announced plans to slash 5,500 jobs, or about 7% of the company's overall workforce. It's also backing away from the muni bond business and selling $15 billion in assets to a fund managed by Blackrock. * Fannie Mae, for its part, lost $2.19 billion, or $2.57 a share. That's much worse than the 64 cent-per-share loss that analysts were expecting. The company is once again going hat in hand to the market, looking to raise $6 billion in capital via the sale of common and convertible preferred shares. It sold $7 billion in preferreds back in December. "The companies, which say fears that they might falter are baseless, have recently received broad new powers and billions of dollars of investing authority from the federal government. And as Wall Street all but abandons the mortgage business, Fannie Mae and Freddie Mac now overwhelmingly dominate it, handling more than 80 percent of all mortgages bought by investors in the first quarter of this year. That is more than double their market share in 2006. "But some financial experts worry that the companies are dangerously close to the edge, especially if home prices go through another steep decline. Their combined cushion of $83 billion — the capital that their regulator requires them to hold — underpins a colossal $5 trillion in debt and other financial commitments. "The companies, which were created by Congress but are owned by investors, suffered more than $9 billion in mortgage-related losses last year, and analysts expect those losses to grow this year. Fannie Mae is to release its latest financial results on Tuesday and Freddie Mac is to report earnings next week. "The companies are sitting on as much as $19 billion in additional losses that they have not yet fully acknowledged, analysts say. If either company stumbled, the mortgage business could lose its only lubricant, potentially causing the housing market to plummet and the credit markets to freeze up completely. "And if Fannie or Freddie fail, taxpayers would probably have to bail them out at a staggering cost. "Concerns over the companies’ finances have prompted a fierce behind-the-scenes battle between nervous government officials and the two companies. Bush administration officials, the Federal Reserve and lawmakers all believe that the companies’ financial safety cushion is far too thin and have pleaded with them to raise more capital from investors. "Freddie and Fannie, which are enjoying new growth and profits, have largely resisted those pleas, people briefed on the talks say, because selling new shares could dilute the holdings of existing shareholders and drive down their stock prices. Though executives have promised to raise money this year, they refuse to specify how much and when. "Moreover, the companies are using their newfound clout to push Congress and their regulator to roll back the limits that were imposed after recent scandals over accounting and executive pay, according to participants in those conversations." It'll be interesting to see how this whole "public mission vs. shareholder obligations" debate sorts itself out. Frequent readers know that I pay attention to a study the Federal Reserve conducts every quarter on bank loan demand and underwriting standards. The "Senior Loan Officer Opinion Survey on Bank Lending Practices," in the words of the Fed, is designed to shed some light on "changes in the standards and terms of the banks' lending and the state of business and household demand for loans." We just got the latest survey (PDF link) results. The Q2 2008 survey was conducted in April; 56 domestic banks and 21 foreign banks with operations here in the U.S. responded. The results are reported in terms of "net tightening/loosening." Specifically, the Fed adds up the percentage of banks that either "tightened considerably" or "tightened somewhat" in a given loan category and nets that out against the percentage of banks that "eased somewhat" or "eased considerably." On this page, which has historical data, a positive percentage figure means more banks tightened than loosened; a negative percentage figure means more banks loosened than tightened. So what did the latest survey show? * A net 55.4% of lenders tightened standards on commercial and industrial (C&I) loans to large- and mid-sized customers in Q2 2008. That was up from 32.2% in the prior quarter and -3.7% a year earlier (meaning that a year earlier, banks were generally easing standards on these kinds of loans). This measure hasn't been higher since Q1 2001 (59.7%). Moreover, 71% of those surveyed were increasing the interest rate premium they charged C&I borrowers above and beyond their cost of funds. That's up from 43.6% a quarter earlier and the highest reading on record. The survey data goes back to 1990. * What about commercial real estate (CRE) loans? A net 78.6% of lenders tightened standards there. That's the second-highest reading on record (behind Q1 of this year at 80.3%). More banks reported slack demand for CRE financing, though the net percentage figure ticked up to -37.5% from -46.5%. * The residential mortgage business is in even worse shape. The Fed has only been reporting separate net tightening figures for prime mortgages, "nontraditional" mortgages, and subprime loans since Q2 2007. Some 77.5% of lenders were tightening standards in subprime, while 75.6% were tightening standards in the nontraditional market (think Alt-A loans here). The subprime figure is a new low, while the nontraditional measure is up slightly from 84.6% in the last survey. More importantly, a net 62.3% of lenders surveyed were tightening standards on PRIME mortgages. That's up from 52.9% a quarter earlier and the highest the Fed has ever found. If you use the historical data series, the previous peak tightening reading for residential mortgages was 32.7% in Q1 1991. * Last but not least, the percentage of lenders tightening standards on credit card loans jumped to 32.4% from 9.7% in Q1 2008. That's the highest since Q2 1997 (45.9%). The tightening percentage for other consumer loans is now running at 44.4%, the highest since the Fed began collecting data on that category of loans in 1996. The latest Fed figures tell the same tale -- lenders are generally pulling in their horns after several years of crazy credit condition. The tightening trend is most aggressive in the mortgage arena. But banks are also getting stingier with consumer, corporate, and commercial real estate loans. It's worth noting that measures of consumer credit demand have improved slightly. So it's not that consumers don't WANT to borrow -- it's that many can't under today's tighter guidelines. Yet another stronger-than-expected economic report just hit the tape. The ISM Services Index came in at 52 in April. That compared to expectations for a reading of 49.1 and a March reading of 49.6. The new orders subindex was essentially unchanged (50.1 vs. 50.2 in March), the employment subindex improved slightly (to 50.8 from 46.9), and the prices paid index climbed (to 72.1 from 70.8). Bonds are trading slightly lower in price (both before and after the news). There haven't been a lot of significant credit market tremors in recent days. The market has taken each and every capital raising, credit downgrade announcement, and so on in stride. But S&P just announced that it was cutting its rating on Countrywide Financial debt to "junk" status. The news follows an earlier story from Bloomberg that focuses on concerns Bank of America wouldn't back all of Countrywide's debt in its proposed takeover deal. "Bank of America Corp., the second- biggest U.S. bank, said it may not guarantee $38.1 billion of Countrywide Financial Corp.'s debt after taking over the mortgage lender, increasing the likelihood of a default. "There is no assurance that any such debt would be redeemed, assumed or guaranteed,'' the bank said in an April 30 regulatory filing, adding that no decision has been reached. Investors had grown more optimistic the bank would back Countrywide debt, and Standard & Poor's said this week it may raise Countrywide's rating to match Bank of America's. "Prices on instruments that protect investors from a Countrywide default made their biggest jump since March 10. Bank of America agreed in January to buy the largest U.S. mortgage lender for $4 billion amid speculation that the worst housing market since the Great Depression would bankrupt Countrywide. Bondholders are counting on the merger to put Bank of America's AA credit rating behind Countrywide's $97.2 billion of debt. "Countrywide's $1 billion of 6.25 percent notes due in 2016 fell 2.5 cents to 89.5 cents on the dollar at 12:24 p.m. in New York, according to Trace, the bond-price reporting system of the Financial Industry Regulatory Authority. The debt yields 8 percent, or 4.2 percentage points more than similar-maturity Treasuries, Trace data show. The debt fell to about half that price in January before Bank of America announced the purchase of Calabasas, California-based Countrywide. "I'd be quite concerned if I was a bondholder if the intent of Bank of America is as it reads in the filing,'' said Gary Austin, founder of PDR Advisors LLC in Charlotte, North Carolina, where Bank of America is based. PDR manages about $600 million and doesn't hold Countrywide debt. "Credit-default swaps tied to Countrywide's home-lending unit climbed 35 basis points earlier today to 190 basis points, according to London-based CMA Datavision. The instruments pay buyers if a company breaks its debt agreements, and a rising price shows investors are more concerned about default." "Standard & Poor's Ratings Services said Friday it lowered ratings on Countrywide Financial Corp. and Countrywide Home Loans Inc. to BB+/B from BBB+/A-2. The move was due to the disclosure from Bank of America Thursday that there is no assurance that any of Countrywide's debt will be "redeemed, assumed, or guaranteed" after their pending merger, according to the ratings agency. All of Countrywide's ratings are on CreditWatch Developing due to the uncertainty over the legal status of Countrywide's creditors after the union. Any rating below 'BBB' is deemed "not investment grade" by S&P." * Payrolls were down by 20,000 in April, which compares with an 81,000 decline in March. But that was much better than the -75,000 forecast of analysts. The household survey's measure of job growth was a hefty 362,000, vs. a decline of 24,000 in the month prior. * The unemployment rate dipped to 5% from 5.1%, rather than increasing to 5.2% as forecast. * Average hourly earnings were the weak spot -- up just 0.1% vs. forecasts for a 0.3% gain, and a gain of 0.3% in the month prior. The diffusion index was also weak -- at 45.4 vs. 48 in March. * By sector, there were big losses in construction employment (again). That sector lost 61,000 jobs. Manufacturing lost 46,000. Retail trade shed 27,000 and temporary help services lost 9,000. That was offset by decent hiring in education and health care (+52,000) and leisure and hospitality (+18,000). Bonds are getting their heads handed to them -- with the futures off 26/32 at last count. The dollar is ripping, up more than a cent against the euro. And stock futures are up 14 (on the S&P). UPDATE: I can not stress how important today's activity in the bond market could be. 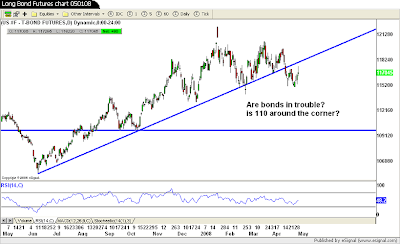 The low-115 area is the critical level for the continuous long bond futures. If we break there, I think it's going to get ugly. "Central banks have continued to work together and to consult regularly on liquidity conditions in financial markets. In view of the persistent liquidity pressures in some term funding markets, the European Central Bank, the Federal Reserve, and the Swiss National Bank are announcing an expansion of their liquidity measures. "The Federal Reserve announced today an increase in the amounts auctioned to eligible depository institutions under its biweekly Term Auction Facility (TAF) from $50 billion to $75 billion, beginning with the auction on May 5. This increase will bring the amounts outstanding under the TAF to $150 billion. "In conjunction with the increase in the size of the TAF, the Federal Open Market Committee has authorized further increases in its existing temporary reciprocal currency arrangements with the European Central Bank (ECB) and the Swiss National Bank (SNB). These arrangements will now provide dollars in amounts of up to $50 billion and $12 billion to the ECB and the SNB, respectively, representing increases of $20 billion and $6 billion. The FOMC extended the term of these reciprocal currency arrangements through January 30, 2009. "In addition, the Federal Open Market Committee authorized an expansion of the collateral that can be pledged in the Federal Reserve's Schedule 2 Term Securities Lending Facility (TSLF) auctions. Primary dealers may now pledge AAA/Aaa-rated asset-backed securities, in addition to already eligible residential- and commercial-mortgage-backed securities and agency collateralized mortgage obligations, beginning with the Schedule 2 TSLF auction to be announced on May 7, 2008, and to settle on May 9, 2008. The wider pool of collateral should promote improved financing conditions in a broader range of financial markets. Treasury securities, agency securities, and agency mortgage-backed securities continue to be eligible as collateral in Schedule 1 TSLF auctions." Linens 'n Things became the latest casualty of the housing slump, filing for Chapter 11 bankruptcy protection this morning. The home furnishings retailer was acquired by the private equity firm Apollo Management in 2006. LNT plans to close 120 of its 589 stores as part of the bankruptcy reorganization. We have an interesting technical set-up in the bond futures heading into tomorrow's April employment report. As you can see in this chart, bonds broke down below the multi-month price uptrend several days ago. 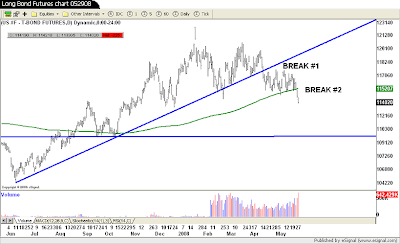 They marked time after that ... then rallied today ... and then "failed" at the underside of the broken trendline. If we get stronger-than-expected jobs data tomorrow, there's a very real chance the bonds will give up the ghost. And technically speaking, there isn't any real strong support until you get all the way down to the 110 area. We wouldn't fall that far tomorrow. But we could do so over the course of a few months. That would likely push 30-year fixed mortgage rates up into the 6.5% area. Worth watching for sure. * Both initial and continuing jobless claims rose in the most recent week. Initial filings were up 35,000 to 380,000 while continuing claims topped the 3 million mark. At 3.019 million, they are the highest since April 2004. * Challenger, Gray & Christmas said layoff announcements jumped 27.4% from a year ago in April. At 90,015, job cuts were also up more than 36,400 from March. Financial cuts topped the list at 18,443, followed by telecommunications (6,810), and computers (4,687). * The April ISM index was unchanged at 48.6 in April. The prices paid subindex rose to 84.5 from 83.5 in March -- the highest going back to May 2004. The new orders subindex was unchanged at 46.5, while the employment subindex slumped to 45.4 from 49.2. That's the lowest this measure has been since May 2003. * Construction spending fell 1.1% in March. That was worse than the -0.7% reading that was expected, but February's figure was revised to +0.4% from -0.3%. Private construction spending was down by 1.7%, led by a 4.6% plunge in residential spending. That's the biggest one-month drop since the government began tracking this series in 1993. Nonresidential spending actually increased by 1.9%, led by lodging, office, and communication spending. I suspect this activity will start declining on a fairly consistent basis in 2008. Net it all out and you get a mixed bag for the markets: Long Bond futures are holding gains from earlier, which were prompted by the lousy jobless claims figures. They were recently up 22/32. The Dow is modestly higher at +23. After initially selling off post-Fed, the dollar has continued to catch a bid that began around 3 a.m. EDT. The dollar index is now up about 70 bps to 73.21. On an unrelated note, I implore you to read this wonderful quarterly letter from Jeremy Grantham, the chairman at money manager Grantham, Mayo, Van Otterloo & Co. It does a fantastic job of summing up the Fed's responsibility for the recent spate of asset bubbles -- and chastising the moral hazard dilemma the Fed's ongoing bailouts create.